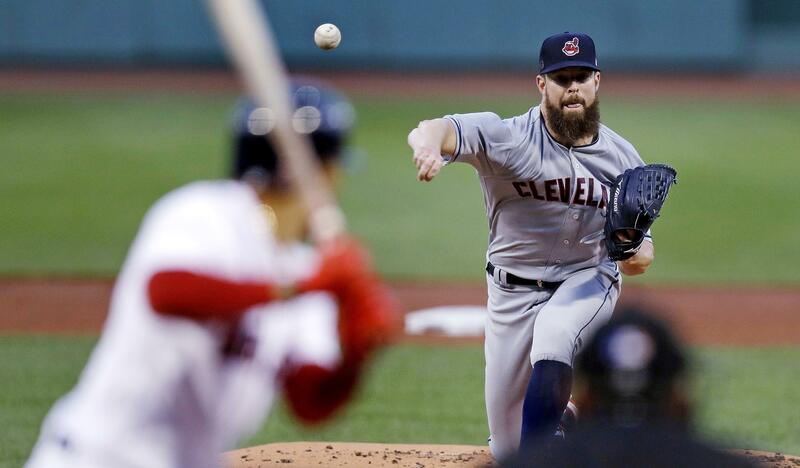 Mon., Aug. 20, 2018, 10:39 p.m.
Greg Allen hit a tiebreaking homer right after Boston pitcher Rick Porcello was struck in the midsection by a line drive, and Corey Kluber tied for the major league wins lead as the Cleveland Indians beat the Red Sox 5-4 on Monday night in Boston. Kluber (16-6) pitched into the seventh inning and matched Washington’s Max Scherzer and the Yankees’ Luis Severino for the most victories in the majors. Michael Brantley and Melky Cabrera also homered to help the A.L. Central-leading Indians improve to 14-4 in August. In a matchup of the A.L.’s last two Cy Young Award winners, it was 3-all into the seventh. Porcello (15-6) retired the first two batters. Yan Gomes followed with a liner that hit Porcello near the stomach – Porcello retrieved the ball near the mound, threw to second for a forceout and then slid to his knees, grabbing the spot where he was hit. Braves 1, Pirates 0: In Pittsburgh, Bryse Wilson worked five solid innings, becoming the third 20-year-old pitcher to start in his big league debut for Atlanta this season as the Braves edged Pittsburgh. Wilson (1-0) allowed three hits, struck out five and walked three as Atlanta increased its N.L. East lead to one game over idle Philadelphia while ending its four-game skid. Dan Winkler pitched the ninth, working around a leadoff single for his second save. Pittsburgh has allowed exactly one run in five straight games, but has lost three of them. The organization hasn’t done that since July 13-18, 1888, when they were the Alleghenys, according to Stats. Pirates starter Chris Archer (4-6) was removed after four innings because of left leg discomfort. Pittsburgh is optimistic he’ll make his next scheduled start. Blue Jays 5, Orioles 3: In Toronto, Kendrys Morales homered twice, Marco Estrada pitched 5 1/3 innings to win his second straight start and Toronto improved to 8-0 at home against Baltimore this season. Morales hit a one-out solo homer in the fourth, then added a three-run drive in the fifth – both off Baltimore right-hander Andrew Cashner (4-11) – for his 22nd career multihomer game. Renato Nunez replied with a solo home run for the struggling Orioles, who have lost nine of their past 11. Estrada (7-9) allowed three runs and seven hits, improving to 9-2 in 18 career games against Baltimore. Ken Giles finished for his 16th save in 16 opportunities. White Sox 8, Twins 5: In Minneapolis, Matt Davidson homered, Lucas Giolito (9-9) struck out six in six innings and Chicago spoiled Stephen Gonsalves’ major league debut. Playing without manager Rick Renteria, Chicago won for the fourth time in five games in the makeup of snowed-out April contest. Davidson drove in three runs, and Jose Abreu had two hits and two RBIs. Renteria experienced lightheadedness before the game and was taken to a hospital as a precaution. Bench coach Joe McEwing served as the manager, and the team said tests on Renteria didn’t show any problems. Jake Cave and Max Kepler homered for the second straight day for Minnesota, which had won five of six. Gonsalves (0-1) surrendered four runs in just 1 1/3 innings. Rays 1, Royals 0: In St. Petersburg, Florida, Ryan Yarbrough helped extend Tampa Bay’s shutout streak to 23 innings, and the Rays got their only run via video replay in a win over Kansas City. Yarbrough (12-5) pitched 5 1/3 innings in relief of Hunter Wood. The rookie left-hander gave up two hits and a walk while striking out six, earning his major league-leading 10th relief win. Jose Alvarado pitched the ninth for his fifth save and stretched the Rays’ streak of scoreless innings, which included 14 over the weekend in Boston. Willy Adames drove in the game’s only run. After singles by Ji-Man Choi and Kevin Kiermaier in the second inning, Adames hit a two-out chopper over third base. Adames beat Rosell Herrera’s throw across the diamond, but it took a 43-second review to reverse the original out call. The run came off right-hander Jorge Lopez (0-3), who pitched five innings in his second major league start. Brewers 5, Reds 2: In Milwaukee, Travis Shaw and Christian Yelich homered, Chase Anderson settled in after giving up two solo homers and Milwaukee rallied for a victory over Cincinnati. Shaw’s two-run homer off Homer Bailey put the Brewers up 3-2 in the sixth. Jesus Aguilar singled to open the inning and Shaw followed with his 25th homer, lining an 0-2 pitch into the right-field seats. Anderson (8-7) entered tied for the N.L. lead with 24 homers allowed and gave up second-inning solo shots to Eugenio Suarez and Phillip Ervin as the Reds took a 2-0 lead. Anderson then retired the final 14 hitters he faced. Jeremy Jeffress pitched the ninth for his fifth save. Bailey (1-11) kept the Brewers off the scoreboard until Yelich’s 20th homer, a one-out solo shot in the fifth that made it 2-1. Bailey, who has not won since May 12, allowed three runs on five hits in six innings, striking out five and walking one. Giants 2, Mets 1 (13): In New York, Brandon Crawford’s potential inning-ending popup in the 13th was dropped when Mets left fielder Dominic Smith plowed into shortstop Amed Rosario, giving San Francisco a win. The Giants had runners at first and third and two outs when Crawford lifted a high pop. Rosario ranged into shallow left field, waved off Smith and was in position for a routine catch. But the bulky Smith, who more often plays first base, came charging in and barged into Rosario. The ball ticked off Rosario’s glove and fell to the ground, and Andrew McCutchen scored on a botched play scored as an error on Smith. Tyler Bashlor (0-2) got the loss. Athletics 9, Rangers 0: In Oakland, California, Khris Davis hit a long home run after letting a young fan from the Make-A-Wish Foundation sign his jersey, Ramon Laureano hit the first two homers of his career, and Oakland pounded Texas. Davis’ shot for his 37th homer of the year was estimated at 438 feet and clanked off a window in the suite-level in left-center field. He did it wearing a uniform signed by 10-year-old Anthony Slocumb. The Oakland sixth-grader attended the game with a group from the Make-A-Wish Foundation, and Davis asked him to sign his jersey before the game. Laureano connected in the second and again in the sixth with a three-run shot that chased Bartolo Colon (7-11), the 45-year-old Rangers starter scratched a day earlier against the Angels because of back stiffness. Stephen Piscotty homered in the seventh for Oakland. Marcus Semien added an RBI double to back Mike Fiers (9-6). Mariners 7, Astros 4: In Seattle, Robinson Cano hit his first home run since returning from an 80-game suspension, a three-run shot in the bottom of the eighth inning to lift the Mariners over Houston. Seattle won its fifth straight against the Astros, thanks to a huge night from Cano. He doubled twice earlier in the game – his first two extra-base hits since coming back from his suspension for violating baseball’s joint drug policy. But those were precursors to his drive to left-center field off Houston’s Collin McHugh (5-2) with one out in the eighth. It was Cano’s fifth home run of the season and his first since May 12 against Detroit. Seattle pulled within 3 1/2 games of Houston in the division race, while the Astros fell back into a tie with Oakland for the top spot in the West. Alex Colome (4-5) pitched a perfect eighth and Edwin Diaz closed out the ninth for his 48th save. Published: Aug. 20, 2018, 10:39 p.m.